EUR/USD heads in to the trading week 22nd – 26th July having experienced a rise over the past two weeks from around the 1.2830 level (illustrated on the chart below by support marked 3) to around 1.3180 (illustrated on the chart by resistance marked 1). This resistance has proven strong in the past, with a number of reversals throughout April, and seems although it might once again trigger a reversal, as price failed to close above it throughout last week. If price does reverse, it can be expected to fall initially to in term support around 1.3000 flat, (illustrated on the chart by the level marked 2), and if this level is broken then previous low support at 3 could be a potential target. Looking long, if price can break and hold above level 1 (ideally indicated by a daily close above it) then the potential upside is illustrated in Chart 2. 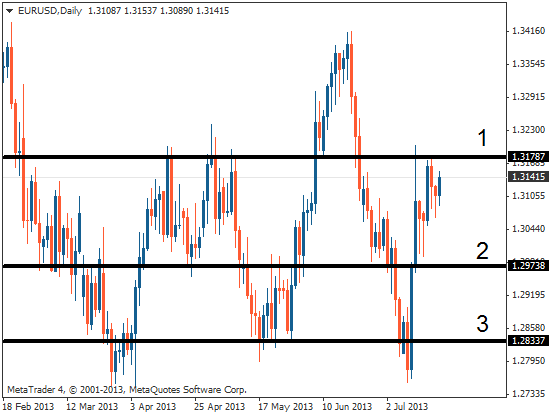 Initial profit targets could be set at in term resistance of around 1.3390 (illustrated on the chart by level 2) and if price can close above this level then a further run towards 1.6340 (illustrated on the chart by level 3) would be relatively unhindered, on a purely technical basis. A break of any of these support or resistance levels is likely to occur as a result of a fundamental rerelease, so to indicate which of the two scenarios (long or short) is the higher probability the week’s data schedule should be considered. On Monday US home sales data is released, and is forecast to have improved on the previous month. If the forecast is correct then this could be bullish for the US Dollar, and in turn bearish for the EURUSD, the same being true in reverse. Wednesday will bring the release of a number of key manufacturing figures from both the Eurozone and the US. While both nations’ figures are expected to be positive the concurrency of their release could increase the markets sensitivity to any difference, large or small, and in turn lead to high volatility in the price of the pair. Unemployment claims for both Spain, and the US are released Thursday. The Spanish figure is expected to remain unchanged, but is being propped up by seasonal employment. The market is undoubtedly aware of this, and so any improvement on the forecast figure will likely be seen to not hold much relevance. Conversely if the figure is worse than expected the market might react harshly, and in turn take a bearish view of the Euro. The US figure is expected to be slightly worse than the previous release. 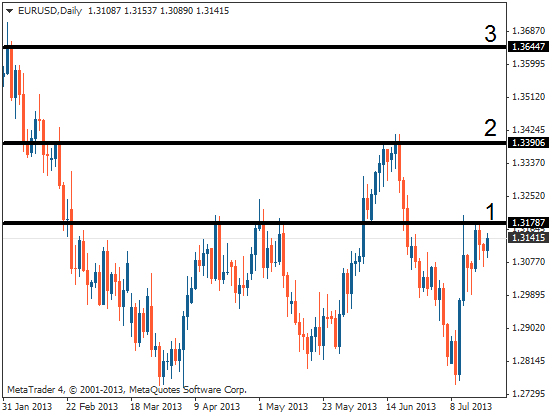 To sum up, traders should look closely at price action at the upcoming resistance around 1.3180. The more likely scenario, indicated by last week’s repeated rejection, is a bearish one. This however should not be taken as guaranteed. A worse than expected data release from the US early in the week for example, might trigger a break of resistance, which if then held as support could see the trend of the last two weeks continue.